Lamictal (lamotrigine) is an anticonvulsive drug frequently used as a mood stabilizer for people living with bipolar disorder. It works by moderating extreme variations in mood and is particularly helpful in treating severe depression. The medication has enjoyed widespread use since its introduction in 1994 and is today among the World Health Organization's List of Essential Medications. Yet, despite its proven benefits, Lamictal has its downsides. In some individuals, Lamictal has been known cause severe rash and inflammation, a finding which led the U.S. Food and Drug Administration (FDA) to issue a black box warning advising consumers about this rare but potentially deadly reaction. In their advisement, the FDA warned about a number of hypersensitivity reactions that may occur in people who take Lamictal. A hypersensitive reaction is one in which a condition or drug causes the immune system to overreact, resulting in allergy or adverse autoimmune response. With Lamictal, these can include reactions known as Stevens-Johnson syndrome (SJS), toxic epidermal necrolysis (TEN), and drug reaction with eosinophilia and systemic symptoms (DRESS syndrome). Each of these conditions manifests with a severe (some say "angry") rash which typically develops after two to eight weeks of drug use. Mortality rates are significant, ranging from 5 percent to as high as 30 percent. Stevens-Johnson Syndrome (SJS) can often be preceded by flu-like symptoms such as a headache, fever, sore throat, cough, diarrhea, and vomiting. This can be followed by an all-body reaction characterized by a quickly spreading rash, swelling of the face and tongue, and the severe blistering of the mucous membranes of the mouth, nose, and eyes. The skin rash can be incredibly painful and, in some cases, lead to the detachment and shedding of skin. Toxic epidermal necrolysis (TEN) is essentially SJS but worse. TEN is defined as the detachment of more than 30 percent of skin as opposed to SJS which involves less than 10 percent. Moreover, the risk of death from TEN is between four and five times greater than SJS. DRESS syndrome is a drug reaction that can also cause rash alongside other characteristic symptoms including severe nerve pain and inflammation of at least one major organ (most often the liver, kidneys, lungs, heart, muscles, or pancreas). Treatment involves the immediate discontinuation of Lamictal and the use of supportive therapies to treat the pain, prevent infection, and ensure that the person remains properly hydrated. The skin damage is treated in a similar manner to a thermal burn. Corticosteroids are commonly used to reduce inflammation. It should be pointed out, however, that hypersensitivity can sometimes occur even if you are taking the drug as prescribed. While genetic factors appear to play a part, the causes are sometimes idiopathic (meaning that we simply don't know the reason). The FDA issued the black box warning due to the high rates of hypersensitivity reactions compared to other drugs used to treat mood disorders. According to their research, there is about a three-fold increase in risk if you take Lamictal as compared to other mood stabilizers. If you are under 16, the risk will further double. It is important to note, however, that not all hypersensitivity reactions will end up with SJS. Putting it all into perspective, there is really only a 0.1 percent chance of such an event occurring. In the end, it was the severity of the reaction, as well as the availability of other mood stabilizing drugs, that informed the FDA decision as much as the statistical risk itself. The bottom line is this: If you experience a rash while taking Lamictal, see your doctor immediately. If it is spreading quickly, call 911 or go to your nearest emergency room. It is far better to be safe than sorry, however,​ low the risk may be. GlaxoSmithKline. "Lamictal (lamotrigine): Highlights of Prescribing Information" Triangle Park, North Carolina; updated December 2016. Wang, X.; Iv, B.; Wang, H.; et al. 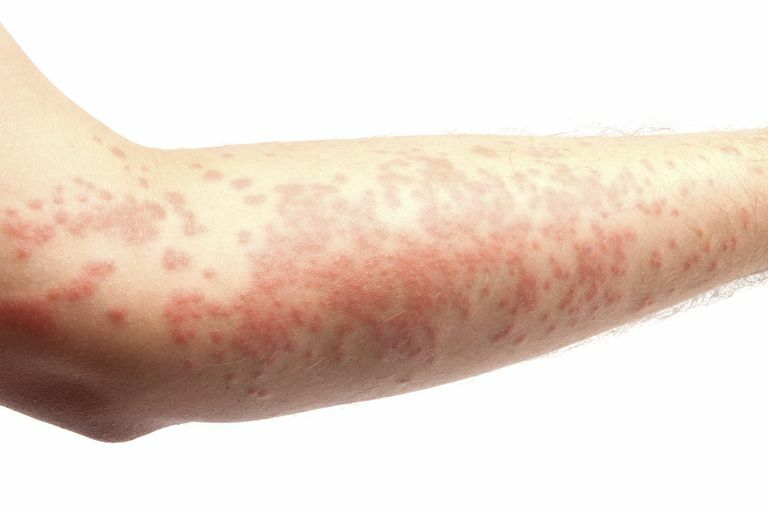 "Lamotrigine-induced severe cutaneous adverse reaction: Update data from 1999–2014." Journal of Clinical Neuroscience. 2015; 22(6):1005-1011.